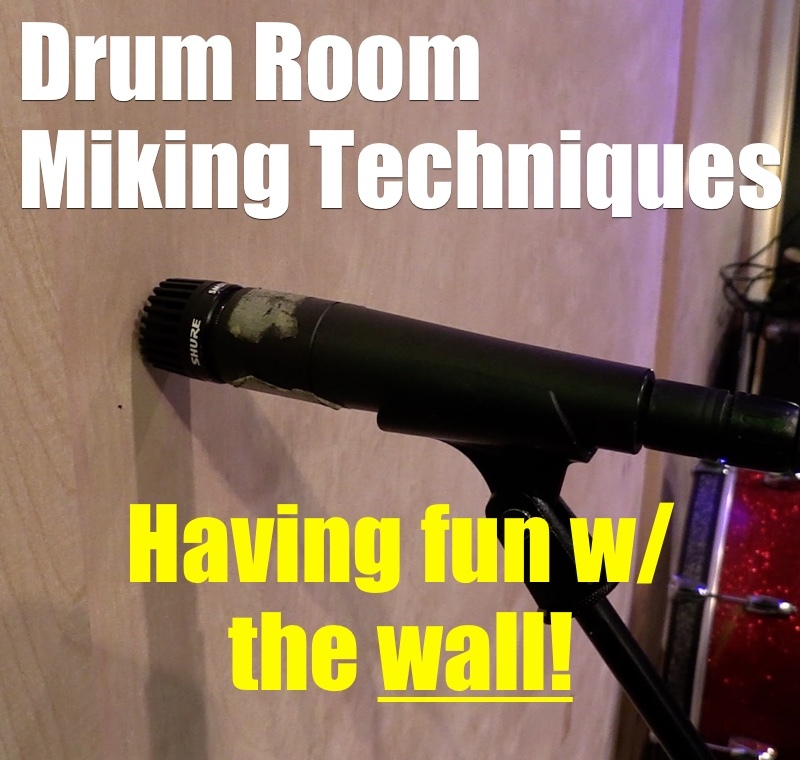 I LOVE experimenting with drum room miking. I also love finding techniques that can work in any room, provide some extra vibe and give me extra options during mix down. That to me is a win win! In our last window we used an amp to create a vibey room sound but in this video we’ll use a wall! One technique (or trick if you will) that I have used for a long, long time is miking the wall. Yes, miking the wall! My mic of choice for this is the ubiquitous SM57 and by placing the mic as close to the wall as possible, so a business card can barely fit between the wall and the mic, the 57 is turned into a boundary mic. The 57 is already filtered on the top and bottom by nature and the wall tends to add to that. I like this because that can help soften the cymbals a little as well as smearing the transient in a really cool way. This is what allowed me to get a “room sound” in my old studio that was pretty small and didn’t actually sound great. 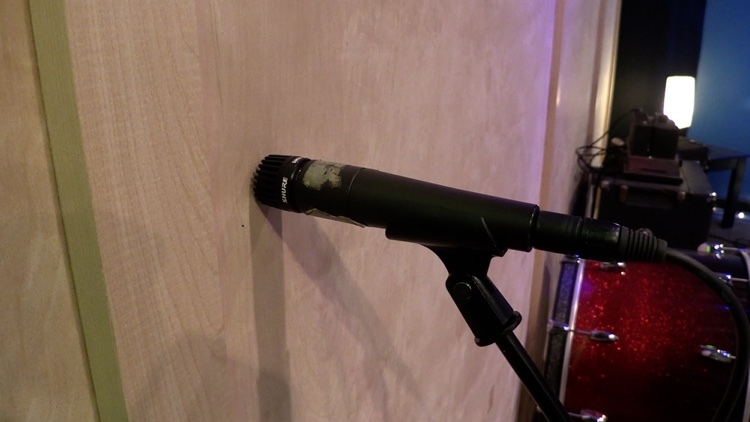 Add a little compression and you can get some real excitement out of this one microphone! Now every room is different. As always I highly recommend experimenting in your room to find the best placement. And don’t forget the floor is a wall too! Check out the video below and let me know how this works for you! 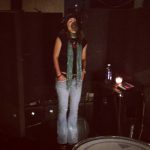 Ultimate Studios, Inc is a full service recording studio, mixing studio and band development resource located in Los Angeles, CA. We believe EVERYONE deserves great sounding music! Ultimate Studios, Inc is a boutique production facility for artists and bands to collaborate, create, and record. Led by Producer/Engineer Charlie Waymire, our team assists artists through the entire creative process including recording, mixing, mastering, and video production. Recording in a room that doesn’t allow for room mics? I have something for you to try! 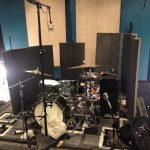 Getting a drum room sound can be challenging without a good sounding room. Especially if your recording at home or in a rehearsal space or another space not designed for getting good acoustic drum sounds. I like to find ways to not only get space from my room sounds but also a VIBE! You know, a sound that adds some cool sauce to your tracks and also puts a unique stamp on them. 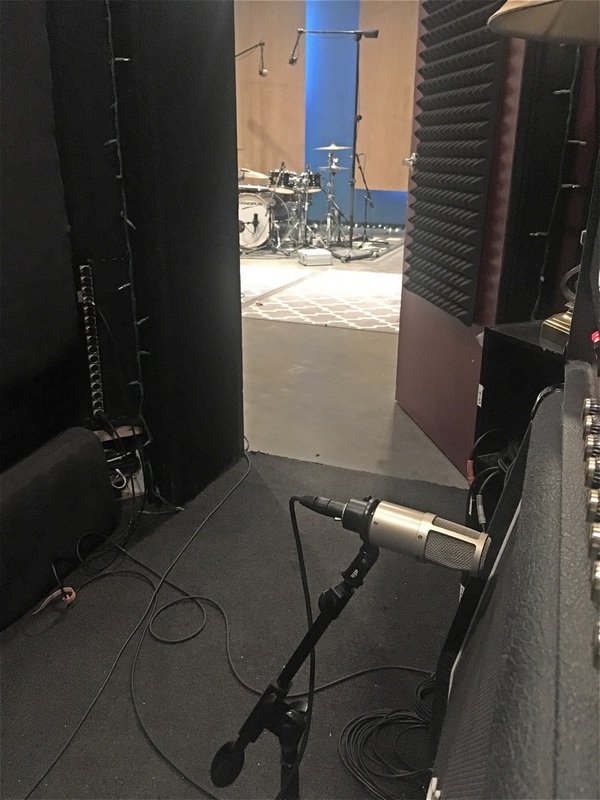 One of the things I’ve done lately is run a microphone in front of the kit, in this case and SM57, into a guitar amp in my ISO booth and miking the amp. At that point you can do all sorts of fun stuff with mic placement, amp settings, distortions, EQ, mic types, etc.. When the sounds are used in moderation this technique can add a space around your kit without sounding too roomy but if used heavily it can really add some cool color to your tone. 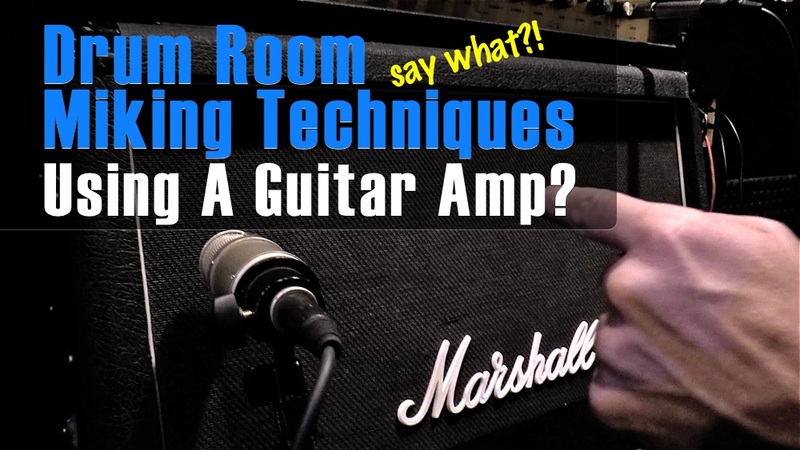 For this video I chose to use my Marshall JCM2000 but you can try this with any amp. My cheap little Fender 212 sounded pretty cool! Give it a shot and leave a comment how it worked for you and what amp(s) you tried! 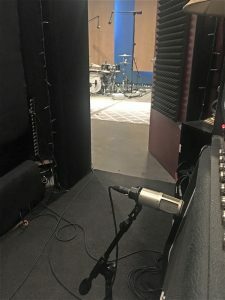 More about Ultimate Studios, Inc.
At Ultimate Studios, Inc we understand that the recording process is just the beginning. That’s why we have a full team to help you create an online presence with full web development, SEO, advertising coaching and designing for Facebook, YouTube and Google. Our ultimate goal is to help bands and artists build a strong brand for a lasting career! I’ll admit I’m a latecomer to the 500 series world. For whatever reason I put it off but the Trident Deca Dent has become an important part of my recording studio tools. It’s been a while since I’ve had time to shoot some new video for the site. I’m excited to be back talking about some of my favorite recording studio tools. Over the past few months while I’ve been hiding in the studio a lot of cool gear has come through the doors but a few pieces have stood out. The Cloudlifter Zi is one of them. As a studio owner it’s always beneficial to find gear that is versatile enough to be used in many applications. I need tools that help me get to the sounds I need as quick as I can and that I can use on every session. The Cloudlifter Zi is one of these pieces of gear. Bass was the first instrument (obviously!) I used it on and man was I happy. 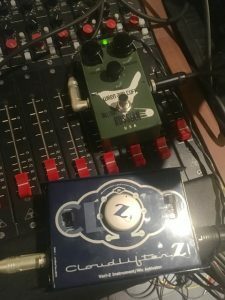 Good player+good bass+Zi= great tone! Add in the variably impedance and I’m able to dial in the perfect tone. Like I said before I like recording studio tools that are versatile. I have used the Zi on quite a few of my drum sessions as well. Quite often I like to put a dynamic mic right in front of the kit pointed at the ceiling and crush it with guitar pedals. 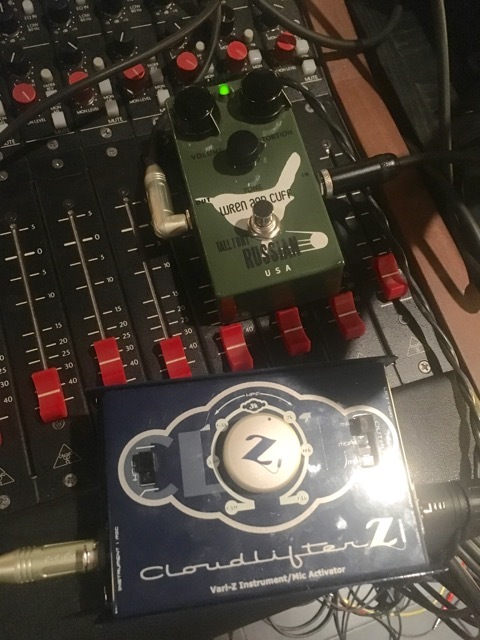 The signal chain goes through the Zi and I use the variable impedance and high-pass filter to tweak the tone to taste. I have done a similar setup with vocals too. Where I have a second mic setup running through a guitar pedal and the Zi. The Zi has become one of my favorite recording studio tools and I use it on almost every session. 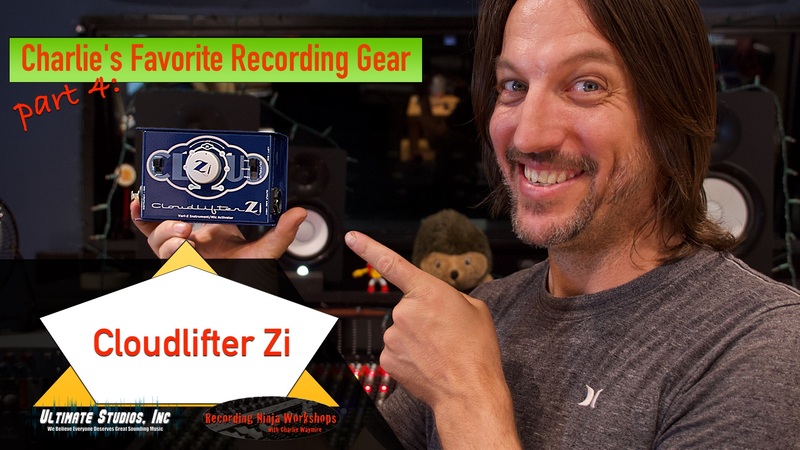 Check out the Cloudlifter Zi from Cloudlifter microphones! 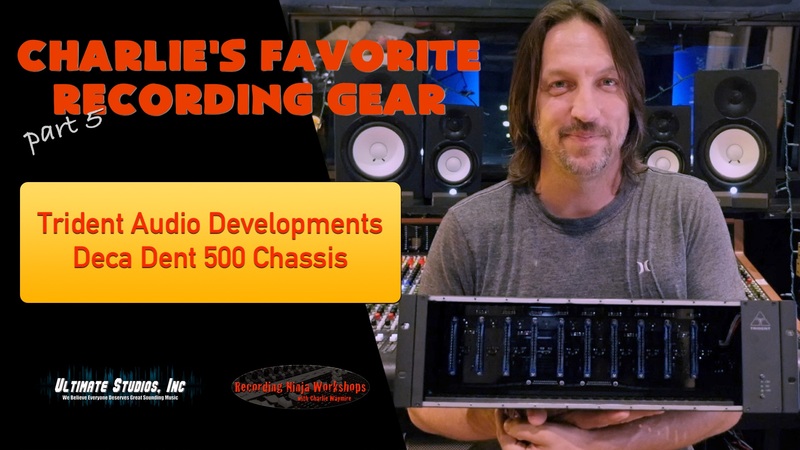 Watch Charlie’s new “Favorite Gear” video and be sure to like and subscribe to the Ultimate Studios, inc Youtube Channel! The size of the price tag is not necessarily the way to judge how good a piece of gear will sound. Or if it will do what you actually need it to do. I pick gear with only 1 thing in mind…..
‘Will this piece of gear do the job I need it to do’. I have inexpensive gear right next to my expensive gear, and it all works. 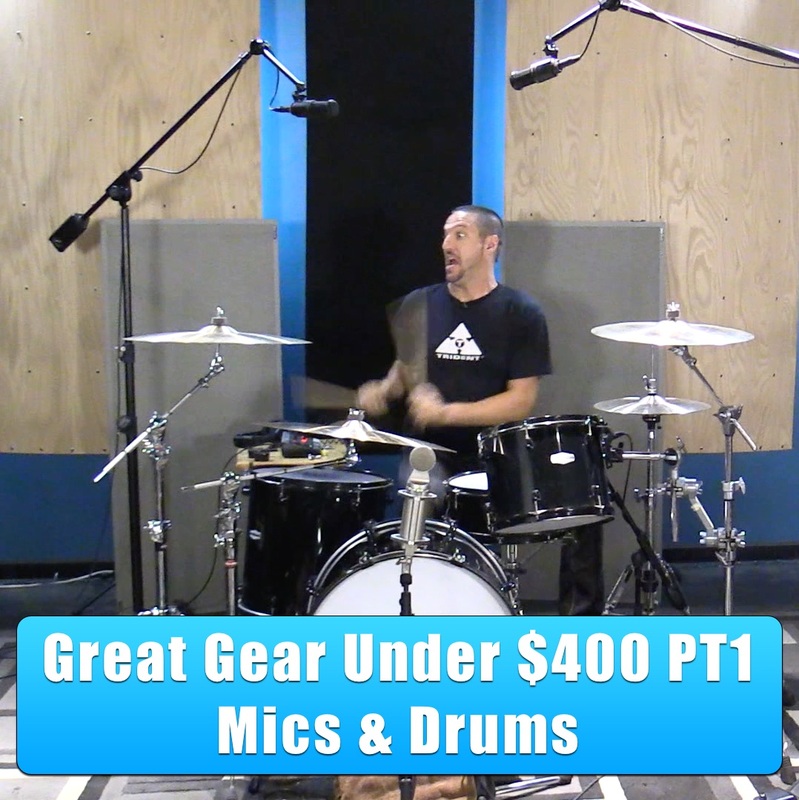 In PT1 of “Great Gear Under $400” I want to show you a few pieces of gear, that I use all the time, that are under $400. I’m starting with microphones and the drum set. This is an excerpt from one of the live broadcasts that got a LOT of attention. I know a lot of you are on a budget. That’s why I did this broadcast, to give you some inexpensive options to add to your studio gear. Enjoy the video and drop me a line to let me know what gear you dig that is under $400! Make Your Kick Drum Thump! It’s time to talk about your bottom….bottom end that is! 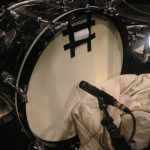 The kick and snare sound you record can really define your overall drum sound and getting it right is super important. Not just recording the kick but actually getting a sound that works for the song. To do that we need to have a good understanding of how a microphone reacts inside the drum. I’m talking about mic placement. Does your sound need to have more click? Does it need more low end? Does it need to be tight and focused? These are questions you need to answer BEFORE you attempt to capture your perfect kick sound. By the way when I’m talking about “click” and “low end” I’m not talking about using eq. I’m referring to mic placement and getting that as right as possible and then utilizing eq. If you take the time to get the mic placement to capture the most sound possible then using eq with make that even better. If you rely on eq to make up for bad mic placement you will often end up with a less than optimal kick drum sound. Bottom line is it’s best to take some time to experiment with the mics that you own to learn how they capture the kick. I promise you the more you know about your mics the better support your kick drum will be for your music. Anyway enough of me blabbing! Let’s get to the video. I’m starting out with a very popular coincident micing technique called X/Y. X/Y consists of two, preferably matching, cardioid microphones at a 90° angle with the elements as close together as possible. This doesn’t produce a very wide stereo image but it is accurate, phase coherent, and collapses to mono well. It’s also easy to setup. In most cases you can mount the two microphones on a single stand using stereo bar. 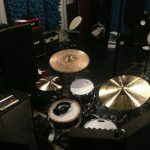 I have a kick and snare mic on the kit as well so you can here how this setup works in context with other microphones. 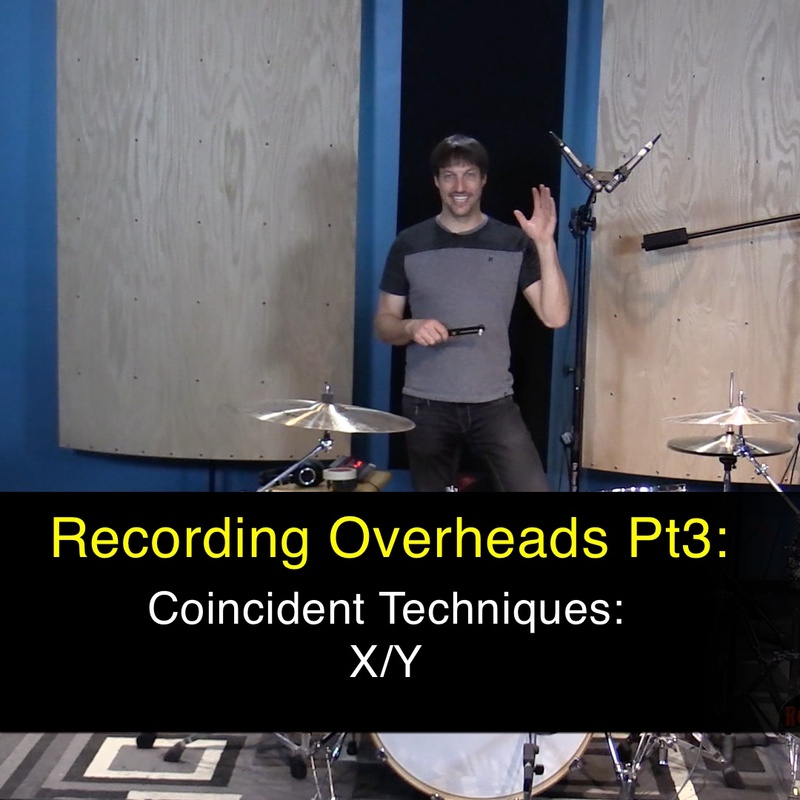 In PT1 of Recording Overheads I talked about using a single, mono, mic to record a great overhead sound. In PT2 I want to demonstrate how you can use different mic types to capture just the sound your music needs. I picked 3 mics; a large diaphragm condenser (AT4047), small diaphragm condenser (AKG451b), and a ribbon mic (AT4080). Each of these mics have unique characteristics and can be used to manipulate your drum sound to fit your music. 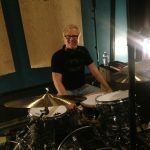 Although there are many different mics to be purchased to record drums I highly recommend having a couple options for overhead choices. 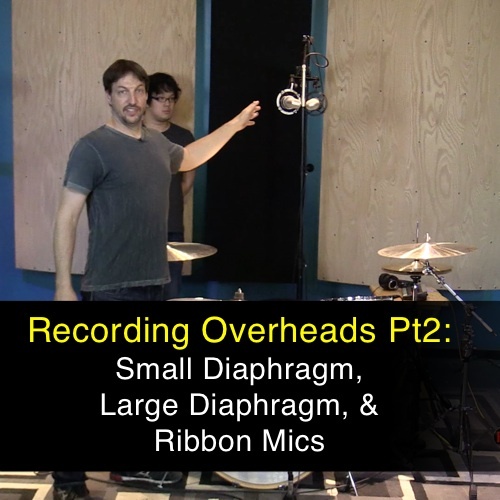 Changing the overhead mics can have the single biggest impact on your drum sound. 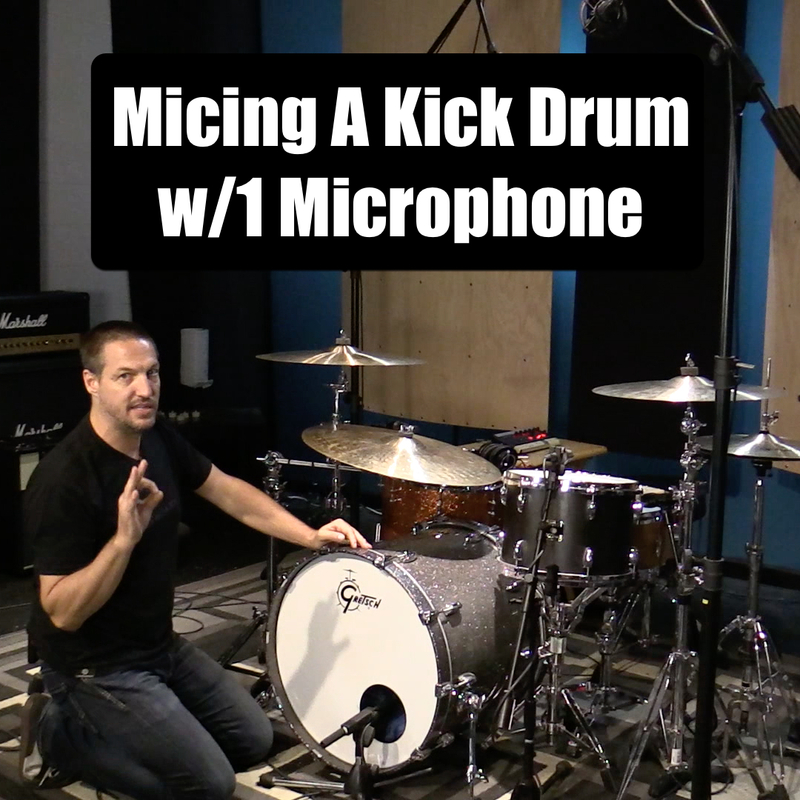 Sure kick mics will make a difference, snare mics to a lesser degree, and even room mics can have a big effect. None of them come close to capturing as much pure, overall, tone as the overheads. 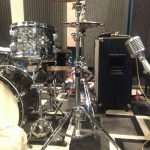 Kick and snare are spot mics and the rooms are effected by, well, the room. I’m not trying to say the other mics on the kit aren’t important because they are. 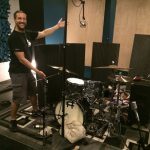 All I’m saying is that you can completely alter your entire drum sound with different overhead mics and it’s worth having a couple options. The point of this video is to give you an idea of what 3 common mics types sound like on overheads. What mics are you using for overheads? 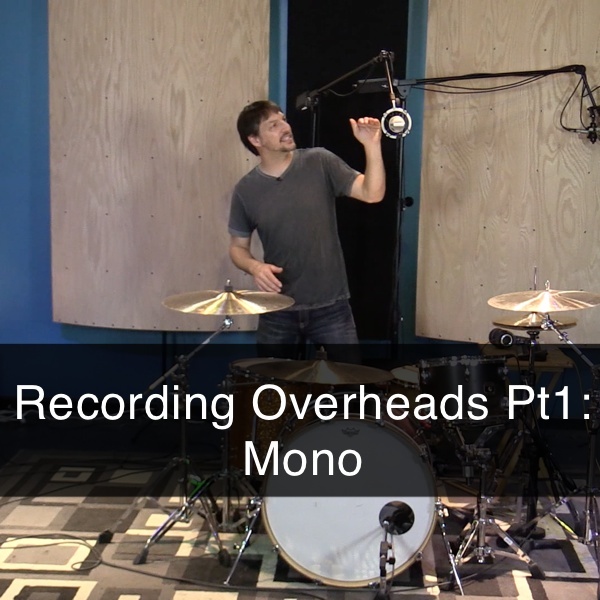 Over the next couple of weeks I will cover 3 or 4 different techniques for recording overheads starting with mono! I think using a mono overhead mic gets overlooked all too often. It’s such an effective way to capture a good drum sound. Plus there are other ways to capture a stereo image…but that’s for another video. In this video we’ll take a look at how the height and placement of the microphone effects your sound. Check back soon for PT2! 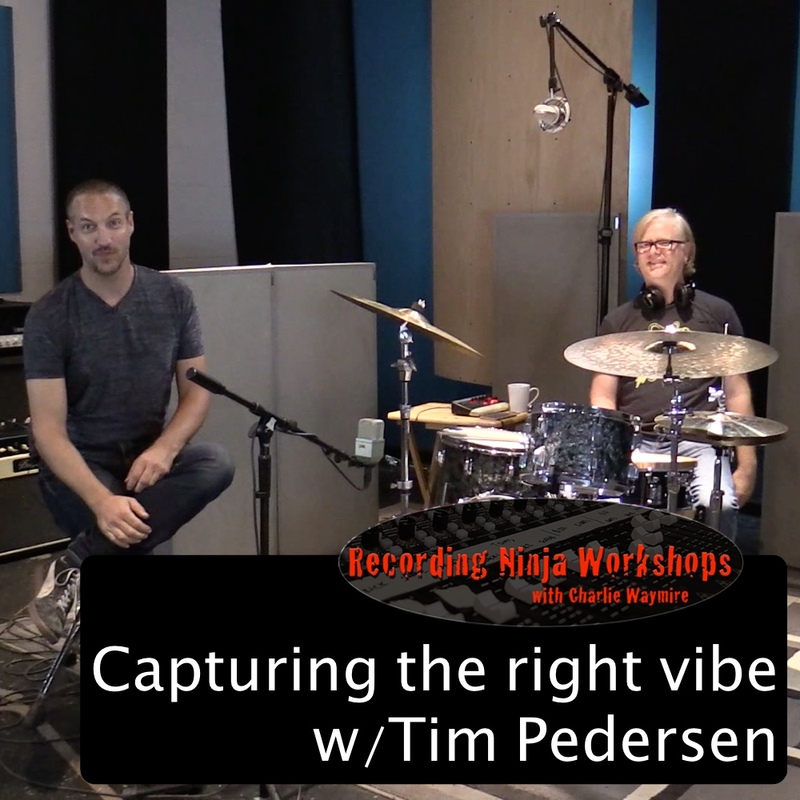 A couple of weeks ago I had the honor of Tim Pedersen joining me on the Recording Ninja Workshop Live Broadcast. Tim has been one of my musical mentors since I moved to LA. 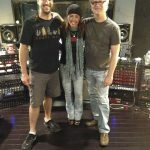 Recently I had the opportunity to work with him on mixing and a little re-recording on an EP for another great friend of mine Tita Hutchison. We covered a lot of great info about how we recorded the drums AFTER we had a mix finished. This video is a 10 minute excerpt from that broadcast. Drums are usually the first instrument to be tracked…and usually quite quickly. Then all the other instruments get to take their time building their parts and sounds on top of the drum tracks. Every once in a while that process gets flipped around and the drums go on last. 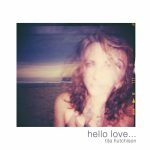 That’s exactly what happened for Tita Hutchison’s song “Frost” off of her debut EP “Hello Love“. We were already deep in the mixing process when we decided that “Frost” needed drums. The song just didn’t feel quite finished and lacked some movement in it’s current arrangement. Since our mix was pretty much done it allowed up to really take some time designing a drum sound that would help move the song along. Tim and I spent a total of about 12 days mixing (all in a row!) and took an entire day to track just drums. It was a really fantastic time. Tim had the idea of giving the drums an old school, vintage vibe. Which is exactly what the song needed. After spending most of the day experimenting with sounds, mic placement, eq, and compression, we landed on something that we were really proud of. It’s a sound that we really felt fit the song and helped move it along. Anyway enough of me talking about it. Enjoy this excerpt from our Recording Ninja Workshop Live Broadcast.